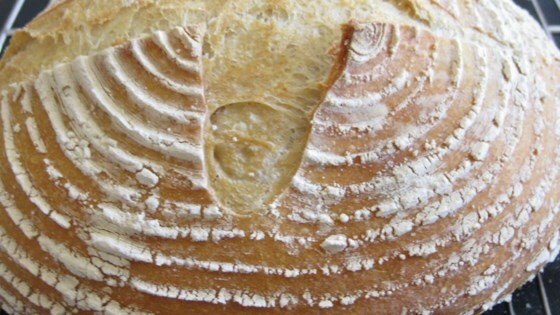 "A simple European style country bread. Just enough whole wheat to give it some flavor but not so much that it's heavy. I use an overnight starter to give it extra flavor." The night before baking the bread prepare this starter: In a medium sized non-metal mixing bowl dissolve 1/2 teaspoon active dry yeast in 1 cup warm water. Add 1 1/2 cup bread flour and mix well. Cover and let sit overnight at room temperature. The next day: In a large mixing bowl, dissolve the 2 teaspoons yeast in the 2 cups warm water. Add the starter mixture, the whole wheat flour, 3 cups bread flour and the salt; stir until well combined. Add the remaining bread flour, 1/2 cup at a time, mixing well after each addition. When the dough has pulled together, turn it out onto a lightly floured surface and knead until smooth and elastic, about 8 minutes. Lightly oil a large bowl, place the dough in the bowl and turn to coat with oil. Cover with a damp cloth and let rise in a warm place until doubled in volume, about 1 hour. Grease two 9x5 inch loaf pans. Deflate the dough and turn it out onto a lightly floured surface. Divide the dough into two equal pieces and form into loaves. Place the loaves into the prepared pans. Cover the loaves with a damp cloth and let rise until doubled in volume, about 45 minutes. Preheat the oven to 425 degrees F (220 degrees C). Very easy to make. The starter method does give additional lift and flavor. I added 1 Tablespoon of honey because my kids are fussy, it doesn't really affect the flavor. Great as toast! It was all right, but I didn't think that it had much taste to it. Really yummy, my family loved it! Reminded me of the bread one of my favorite restaurants serve. Really easy to make and looks lovely after it is baked not to mention the great flavor!